If you want printing on both sides of the sheet, go to the top of this page and Click Here to be taken to the double side notepads category. Front of Sheet OnlyFront & Back of Sheet. Click on "?" to Be Redirected to the Double Side Notepads Category.. If you use colored paper, remember that applying ink to a colored sheet of paper will change the ink color...think of it like mixing paint. 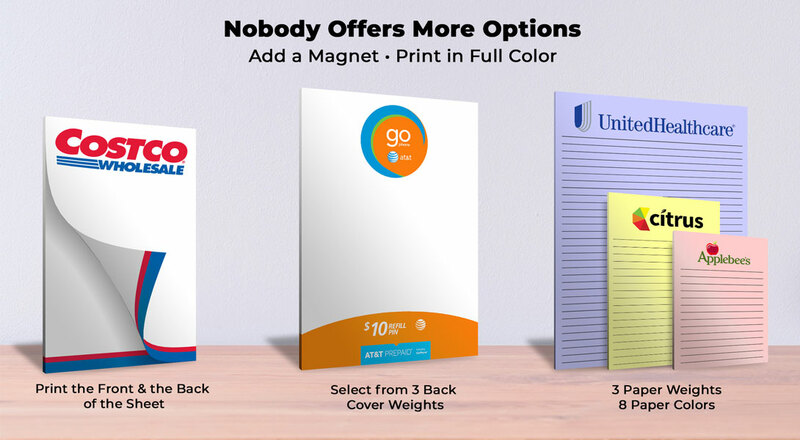 We recommend that you only use black, red, or dark blue ink on colored paper. We are not responsible for ink color distortion on colored paper. WhDue to differences in monitors, the actual printed paper color may vary from colors reflected above. Ultra Heavy Brown 2 Ply Chipboard Backing provides a rigid back and is approximately twice as thick as chipboard. 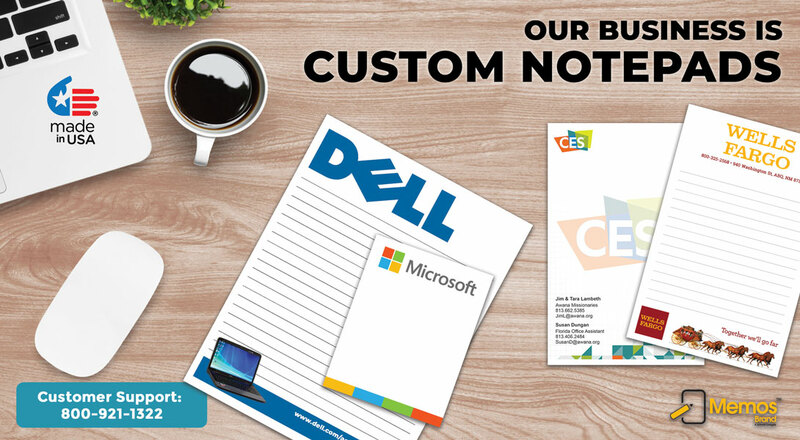 Superior quality full color custom notepads sized 4.25" x 11" from North America’s largest manufacturer of custom notepads for over 19 years. After you complete STEPS 1 thru 3 in the calculator on the left, you will be given the option to design your product online in our design studio or if you choose, you can download a pre-sized template and create your product design offline at your leisure and then upload your design in STEP 3 on the left. We also give you the option to work with one of our talented graphic designers to design the perfect product. You have full access to our image library so you can design your custom notepads to fit any occasion. Use the product calculator on the left to see our standard customization options. Size: 4.25" x 11", bound on the 4.25" side or 11" side. Create your custom notepad in either portrait or landscape. 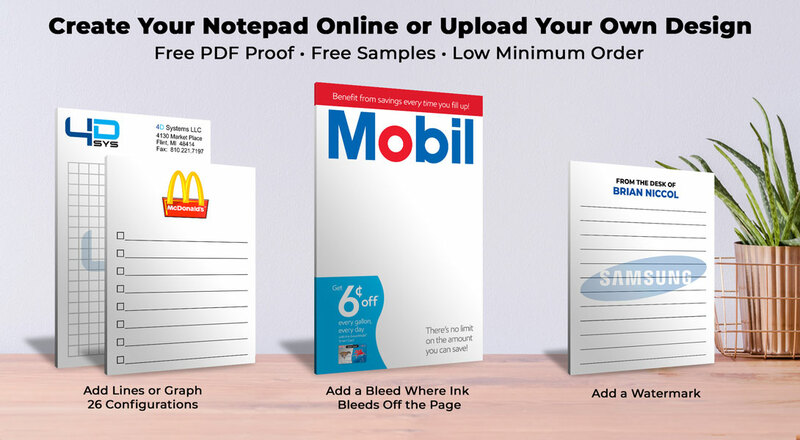 Print your custom notepad in full color or economical all black. You can create your custom notepad with a bleed and/or a watermark. Select from the industry’s largest offering of paper colors and weights: Select 20LB Bond (same as 50LB Text); 24LB Bond (same as 60LB Text) or 20LB Bond recycled paper (same as 50LB Text). Heavy brown chipboard backing or optional 2-ply ultra heavy brown chipboard back. All notepads are manufactured in our own USA factory for superior quality. There are NO SET UP FEES which saves you the $25.00 per ink color set up fee charged by other suppliers. 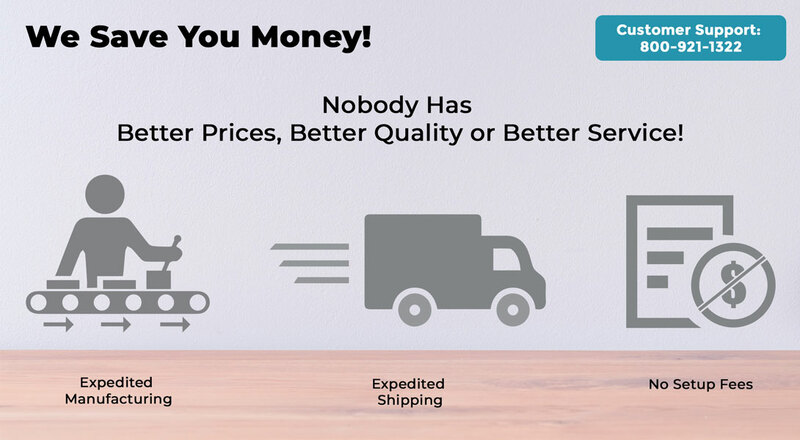 We guarantee the lowest price on the internet every day with no hidden fees.